Toward the end of the Season 8 premiere, titled “Winterfell,” Daenerys (Emilia Clarke) and Ser Jorah (Iain Glen) visited Sam, who had been hunkered down studying the books he stole from the Citadel to figure out how best to beat the Night King and his Army of the Dead. This is the first time Sam has met Dany since she arrived at the Starks’ ancestral home, but he has previously been acquainted with Jorah — having peeled all that Greyscale off him at the Citadel. Dany specifically thanks Sam for his help in saving Jorah and pardons him for stealing the books and a sword from the Tarly home — and that’s when she puts two and two together. Dany realizes Sam is the son of Randyll Tarly and brother to Dickon Tarly, two men she happened to smite with her dragons because they wouldn’t bend the knee. And she tells Sam this in a very chilling way. Ah, yes, to “tell Jon.” The moment that comes next is Sam realizing — after a little nudging from Bran — that he must finally tell his best friend Jon Snow (Kit Harington) that he is really Aegon Targaryen, the son of Prince Rhaegar and Lyanna Stark and rightful heir to the Iron Throne. 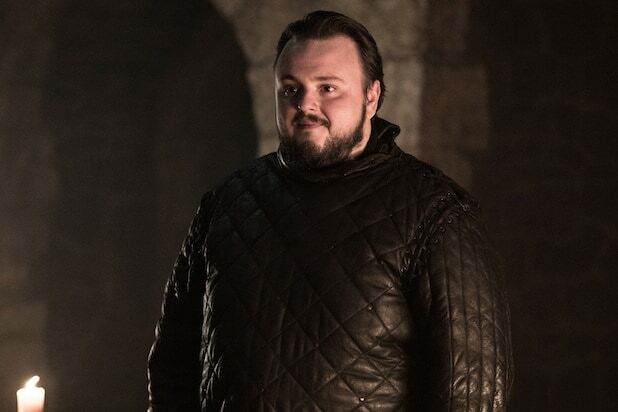 But Sam has understandably been waiting to divulge this fact, because it leads to an awkward conversation in which Sam must tell Jon his lover Dany is actually his aunt (gah) and that the late Ned Stark, the man he thinks is his father, lied to him his whole life. And yes, Bradley says Sam does want Jon to rule Westeros, not Dany. Oh, in case you were wondering — because we didn’t see them in the premiere — Little Sam and Gilly are doing just fine there in Winterfell. “Yes, they are safe in Winterfell. They are being very well looked after,” Bradley assured us, laughing.